On this episode of the StoryCorps podcast, two stories from veterans about friendships they forged on the battlefield. After decades of separation from the military — and each other — you’ll hear from soldiers, and the medics who had their backs. First, a story from the Vietnam War that starts in 1967. By that time, close to 500,000 US troops were serving overseas, including Kay Lee and John Nordeen. Kay was 22, a combat medic from San Francisco. John was 20, a soldier from Seattle. They were West Coast guys assigned to the same army platoon and became fast friends. Nearly 50 years later, they sat down at StoryCorps to remember how they first met. And second, a conversation with Retired First Sergeant Keith Melick, who spent almost three decades in the military as a medic. And although he saved the lives of countless soldiers over the years, he never got to know them beyond those critical moments of care. But in 2014, a chance encounter at a VA medical center in North Carolina brought Keith face-to-face with Roy Wilkins, a command sergeant major in the army’s Special Forces, ten years after Keith rescued Roy in Afghanistan. Top image: Artwork by Eleanor Davis. 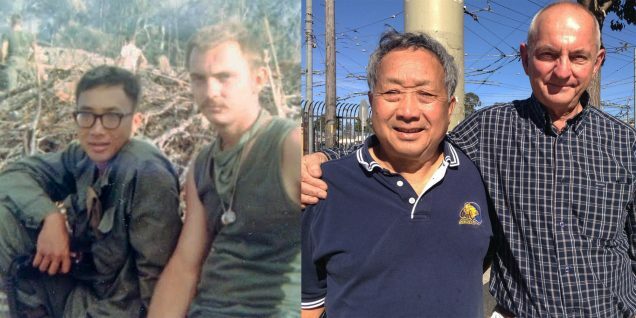 Middle photo: Kay Lee and John Nordeen in 1967 during the Vietnam War, left, and in 2018 after their StoryCorps interview in San Francisco, CA. Left photo courtesy of John Nordeen, right photo by Susan Lee for StoryCorps. Bottom photo: Retired Army Special Forces Command Sgt. Maj. Roy Wilkins (left) and retired 1st Sgt. Keith Melick (right) at their StoryCorps interview in Lansing, Kansas. By Natalia Fidelholtz for StoryCorps. Jasmyn Morris (JM): In this week’s episode of the StoryCorps podcast, we’re honoring Veteran’s Day with two stories of friendships forged on the battlefield. Kay Lee (KL): After one firefight, you came to me and you showed me a helmet with a bullet-hole in it and I can’t believe you’re alive. John Nordeen (JN): Yeah, that was a day where a lot of other guys weren’t as lucky as me. Roy Wilkins (RW): …and that stuck in my ear for years. I kept hearing this voice – I got you. I got you. JM: People often come to StoryCorps to interview loved ones and reconnect with the past. 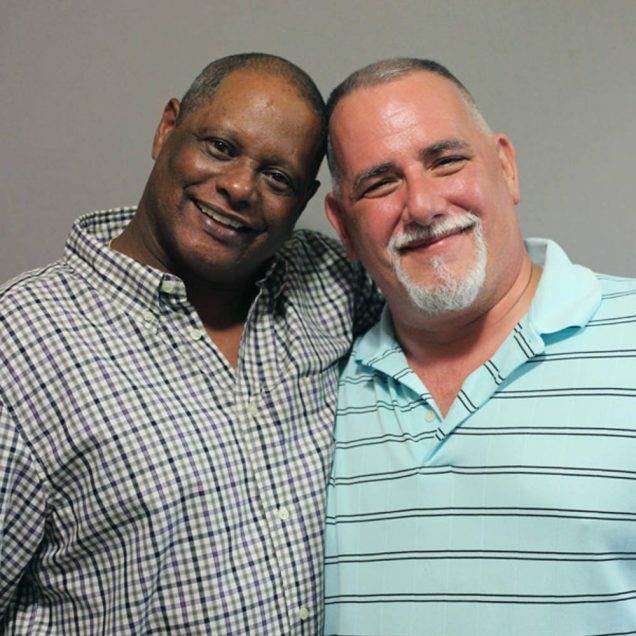 And in this season of the StoryCorps podcast from NPR – stories of reunions. In this week’s episode, after decades of separation from the military – and each other – conversations between soldiers and the medics who had their backs. JM: Our first story starts in 1967… during the Vietnam War. By that time, close to five hundred thousand US troops were serving overseas, including Kay Lee and John Nordeen. Kay was 22, a combat medic from San Francisco. John was 20, a soldier from Seattle. They were West Coast guys assigned to the same Army platoon and became fast friends. They lost touch after the war, but 50 years later, they sat down at StoryCorps to remember how they first met. JN: We were hiking through the jungle one day and you had an inordinate amount of stuff on your pack and you were just tripping and stumbling. KL: I was just about to pass out and, fortunately, someone else passed out before me so, being the medic, I had to treat him. That gave me a chance to catch my breath. You were one of the first person I talked to and, you know, I’m from a very sheltered life, so I thought you were a little crazy. JN: I was a pretty rowdy kid, I’ll give you that, and that was part of how we survived. JN: Yeah, I remember that day but that was a day where a lot of other guys weren’t as lucky as me. Our platoon went like from 29 guys to ten guys in two days; so we had even stronger bonds because we had survived this together. And, you know, when you lose friends you develop a hard exterior and you don’t want to make friends with anyone else; so I don’t have a big circle of friends. I think that’s just one of many hang ups I brought home with me. KL: When I got home, I’m not sure if you guys wanted to be contacted. Most of the time, I tried to forget the whole experience and not think about it too much. JN: Yeah… it took years to find you but I found my long lost buddy and it was just like we’d never been apart. KL: You know, all in all John we were so lucky. We survived Vietnam and we’re still here. KL: Well, it’s hard to describe but the friendship and the bond that you form during battle is different than most friendship. It’s like family now; so I’m very grateful for your effort to find me. JM: That’s John Nordeen with his friend Kay Lee in San Francisco. And if you’re wondering how the pair finally reconnected? It turns out that calling all of the “K. Lees” in the Bay area wasn’t such a bad idea. One of the people who answered John’s call was so intrigued by his search for Kay that she joined him in his pursuit…and helped him track the real Kay down. Their long-awaited reunion finally took place on the Mid-Autumn Festival, a Chinese lunar holiday that celebrates family, gratitude and reunions. Next, how a brief connection in Afghanistan led to a chance reunion a decade later. That’s after this short break. Stay with us. Retired First Sergeant Keith Melick spent nearly three decades in the military as a medic. He saw his patients briefly – often meeting and treating them right on the battlefield. And although he saved the lives of countless soldiers, he never really knew them beyond those critical moments of care. That is, until 2014, when a chance encounter at a VA medical center in North Carolina brought Keith face-to-face with Roy Wilkins…a command sergeant major in the Army’s Special Forces. KM: I heard your voice, and, you know, voices stick with you. KM: Yeah… It was November 25, 2004. RW: We was out on a mission to defuse IEDs. KM: And I was in the Humvee behind you. RW: And the next thing I know, I seen a blue flash. RW: And that stuck in my ear for years. I kept hearing this voice – I got you. I got you. And now I’m sitting before the brother that saved my life. KM: In my 28 years of military and through three different combat zones, you’re the first one that I’ve ever reunited with because we don’t know if you live or die. To see you today is like watching the angel walk through the door. RW: I just want to thank you from the bottom of my heart. And I wish I could just take my heart out and show it to you that it is fluttering with nothing but joy. JM: That was retired First Sergeant Keith Melick reconnecting with retired Army Special Forces Command Sergeant Major Roy Wilkins a decade after their paths first crossed in Afghanistan. Like John Nordeen and Kay Lee, Roy and Keith keep in touch regularly. That’s it for this week’s episode. It was produced by Jud Esty-Kendall and me, with help from Andres Caballero and Grace Pauley. Thanks to our engineer, David Herman, script editors Sylvie Lubow and Danielle Roth…and StoryCorps facilitators Susan Lee and Natalia Fidelholtz. The interviews in this week’s episode were recorded as part of our Military Voices Initiative — recording stories of veterans, service members and their families. If you want to leave a voicemail for anyone you’ve heard on this podcast, give us a call at 301 744 TALK. And tell us what you think – write us a review where ever you get your podcasts. To find out what music we used in this episode and to sign up for your own interview, visit our website, www.storycorps.org.